Casey Swansson has been licensed to practice law in Minnesota since October 2013. He is a native of Bloomington, Minnesota and graduated from Gustavus Adolphus College in 2010. In May 2013, Casey graduated from the University of Minnesota Law School. Following graduation from law school, Casey worked as a Judicial Law Clerk for the Eighth Judicial District of Minnesota. 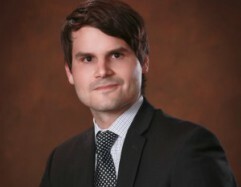 He worked as a Judicial Law Clerk until he joined Anderson, Larson, Saunders, and Klaassen as an Associate Attorney in March 2015. Casey enjoys baseball, hockey, and football, as well as spending time with his family at their cabin in New London.